Accidental fracture of an upper front tooth. After restoration of upper front tooth. After accidentally falling and fracturing his front tooth, this patient was naturally self-conscious about his appearance. At his first visit, the tooth was prepared for a crown and he left the office with a custom fabricated temporary crown in place. The temporary crown replaced both the form and the function of his former tooth and was both comfortable and protective of the underlying tooth. Three weeks later, he returned to the office for a try-in of the new crown. The patient and I determined that the shade of the new crown required a slight adjustment in order to blend better with his natural tooth color. When replacing a single front tooth, it is often necessary to have one or two shade try-in appointments to fine-tune the shade selection. 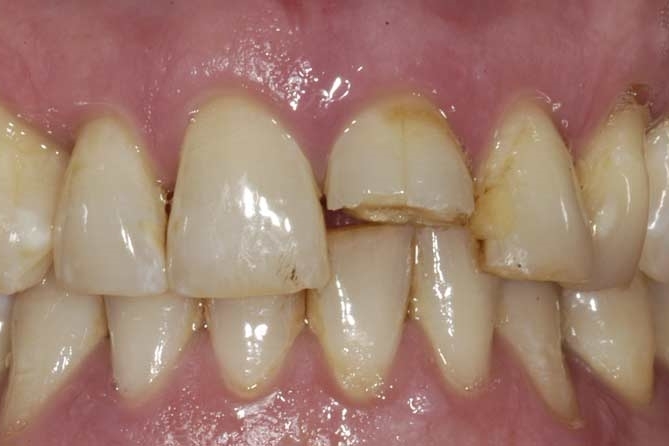 Several weeks later, the patient returned and upon confirmation of a very good shade match, the new crown was bonded into place.